This is an article about your boss’ birthday. Celebrating your boss’ birthday is a way to show your gratitude for the guidance and leadership qualities that have been showered by your boss and that have helped you in some way or the other. Birthday wishes for the boss are one of the best ways to tell him how much you care and love him. Sending b.day wishes for the boss is a good way to express your solidarity. Send some formal birthday wishes to your boss and make him happy. Your boss is your role model for his excellent leadership qualities. Send birthday wishes for the leader that you admire in him. These Happy birthday wishes for your mentor will be remembered by him forever. Having U on our team makes the task and project work very easy and fun to undertake. Happy Birthday and we ask for the blessings of God in your life and family. Being the greatest Boss U are. Your words of encouragement has surely guided us all to be the better people we are. On this special day, I say thank you and Happy Birthday. Monday Motivation trends on Twitter are because of inspiring bosses like U. Happy birthday. A boss like you and an employee like me, we make a smashing team don’t you see? Happy birthday. May God bless you with more success and prosperity. Being a good leader, you deserve all the best that life can offer. Happy Birthday boss! It’s been a pleasure working with inspiring and ideal boss like you. You are a wonderful leader and you deserve nothing but the best on your birthday. Best wishes on your birthday! Happy Birthday to a Boss who is never a boss and always a colleague. Have a great time. You are the only boss I’ve worked with who never bosses around. Happy Birthday! Under your leadership, We have all succeeded more than we could have ever imagined. Thanks and happy birthday Boss. To a special Boss Birthday Greetings and best wishes. To your team, you are a mentor, a leader and a coach. By your examples, you’ve shown us how discipline, teamwork and common sense can get things done. U are an inspiration. Cheers on your birthday. I remember when U said you’d take me on. Thanks for having confidence in me. I am lucky to work with the best Boss ever! I wish U achieve all everything you plan. Happy Birthday! Working with a boss like You is a great pleasure. I hope U will accomplish all your goals. You are the inspiration for all our company. Happy Birthday! Boss, U are the only one who leads all our team in the correct direction. Today we will celebrate and have fun just like real friends. Happy Birthday! Your boss is the most stressed out person, and you want to bring some cheer to him on his special day. Send him some funny birthday wishes that can make him laugh throughout the day. For the female boss, send lovely flowers or a cake and a card with some amazing wishes for the lady. 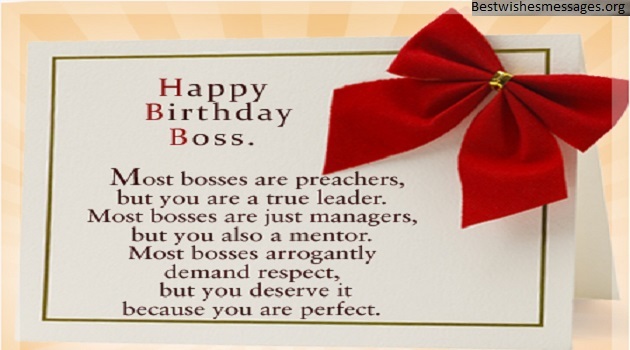 For your male boss, you can send wishes as text with happy birthday wishes to sir. Send funny birthday wishes to him for his happy day. Wish a happy birthday to your boss and your mentor. The wishes to my boss section is a set of some lovely meaningful messages. Your boss is your pride, and he would love to receive some special messages from you on a special day. He and you share a thorough professional relationship, send professional birthday wishes for his birthday. If you have moved on and you have a new boss, but you still want to wish your previous employer, send him birthday wishes for ex-boss and surprise him. A happy birthday message to your senior sir will make him glad and make his day lovely. You can also send warm birthday wishes to your boss in Hindi for a heartfelt message. 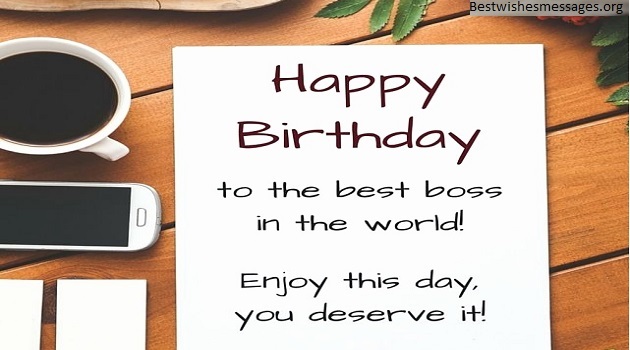 A simply superb message or birthday wishes for your boss in English will surprise him, and he will surely love it. If blessings are like the ocean, you should have drowned by now. Be thankful for another year to live under the wings of God’s race. Happy birthday! I pray that each birthday will continue to inspire you to become the person that God wants you to be. I know there are still a lot of blessings and favor He has in store for you. Have a joyous birthday and for the next years to come. You make working here so much easier and pleasant! For the support, guidance and trust – Thank you! May you have the most wonderful and happiest birthday ever! May you have a wonderful birthday and greatest years for the future to come filled with joy, success and prosperity. Happy Birthday to the best boss! I am sure that you are the best boss ever! I wish U to have a wonderful year. Go ahead, boss! Happy Birthday! I want to wish a happy birthday to the best boss and my role model. U are a very talented and interesting person I am proud to meet and work with. Happy Birthday! Hey, boss, you can’t manage without us! Just kidding. We could never manage without U! May your day be filled with peace and fulfillment away from the chaos of the office. We hope you enjoy your birthday with people who are near and dear to U. We are so grateful for all the insights you have shared and the wisdom that you have imparted upon us. On this birthday of yours, we wish you joy, success and happiness. Wonderful Birthday! Boss, it’s your birthday today and this is why we are on our best behavior. Enjoy your day while you can because tomorrow, we will be back to being busy. Just kidding! Best birthday! May you live longer and may you never retire from your job because we just like you so much that we don’t ever want to lose you, wonderful bday! Happy Birthday to the best boss ever! We wish you a long and successful career. Of course, we also wish you a life that’s filled with so much joy and happiness. U are a very talented person. It was a successful year for you and I hope the next one will be even better. I am proud to work with you. Wish you a very happy birthday! I am happy to have a chance to wish you Happy Birthday. You are a wonderful person and I am proud to work in the team with U. Enjoy your birthday, dear Boss! Today is your birthday and I promise not to bother U today. Wish you all the best in your interesting life. Happy Birthday! Send birthday greetings to your lady boss for her special day. The birthday greetings for the boss are simple yet sweet messages that would be loved by him. Choose some of the most popular wishes for your boss from the staff to send with an appealing gift. Your immediate superiors will love to receive these beautiful words of love for them. A small birthday speech for your boss is all it takes to impress him or her and flatter him or her on this very special day. A formal note to wish birthday to the MD of the company will make him proud of you as his team. On this day, I want to wish a very happy birthday to a highly phenomenal boss. May this day and the rest of your days be filled with enjoyment and internal peace. Warm wishes for a great boss on a great day. I wish you more and more success in your remarkable career. Happy birthday. You are a great person who supports and encourages me on a daily basis. I wish you have an amazing birthday. May you encounter the most wonderful moments in life. Happy birthday, Sir/Madam. Wishing a very Happy Birthday to a wonderful boss. I;m grateful to work with a boss who treats me with love and respect. It is my hope that U continue to spread your wings and fly. Happy Birthday! It is rare to find a good employer and at the same time a friend.I am so glad to be your employee I wish you all the best. Happy Birthday. For all the motivation and inspiration, For all those encouragements and good action. I thank you, Boss. I wish you nothing but the best. You’re a strict and meticulous boss. But you are more a wonderful friend and a nice host. Thank you for the learning and teachings. Be happy and smile always. It’s your birthday! I wish that all your plans will come true and that we could spend a lot of time with you. For you are a wonderful boss we would gladly work to. Happy Birthday! Every member of our team respects U so much. You are our best model of a talented leader. We all want to wish you Happy Birthday! Dear boss, you make the hours of every work day really fun. It must be because of the fact that you have the heart and soul of a true rock star. I never thought what I will put in writing but I am looking forward to Mondays all because of you! You are certainly the best boss ever! U are certainly a rich person, boss! This is because everyone around you owes you a lot. This is because of your kindness and guidance. Best bday! Wonderful bday to a great boss! Your special day is also special for us. You are an incredible leader but an even more incredible friend. You have been such an inspirational leader to my colleagues and me. As you celebrate this wonderful day, it’s my prayer that God will open the gates of heaven and shower upon you unlimited blessings. Wishing you the greatest of birthdays. Regardless of what anyone says, in my eyes, you are a truly remarkable boss. Happy birthday. Every day I am tremendously humbled and honored to have the unique opportunity to work under such an amazing person leader like you. Happy birthday, boss. Happy birthday to a truly great boss! May you have many more years of good health and amazing achievements. Happy Birthday to the best boss in the whole wide world! You’re not just a year older, but a year better! Have a great day and a great year ahead. We have the special birthday messages for your special guy, The CEO. Send your respected Sir, i.e. the boss some warm and amazing birthday wishes to make his day truly memorable. The messages section also contains some beautiful lines for your senior boss, i.e. the directors who are the backbone of the company. The birthday messages for the boss are warm wishes for your seniors and bosses, and they will be more than happy to read them. The section birthday message to my boss has the most wonderful wishes written carefully with the right words and gestures. Send these birthday SMS for the boss and flatter him. If your boss is stressed with everyday work pressures, take the weight off him by sending funny birthday message for boss. For your demotivated boss, send an inspirational birthday wish to motivate him and bring him some cheer. Send a cheerful message to a leader you call the boss. 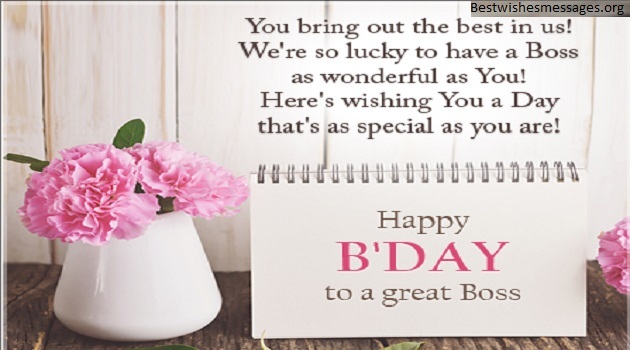 There are the most special happy birthday msgs for your boss to choose from. For a strictly professional boss, there are professional birthday messages too. On this awesome day, I wish to say happy birthday to an extraordinary leader. You are a photo of a successful person. Wish you more and more happy birthday! Congrats! It’s festival time for a persevering person who likewise happens to be a brilliant human. Have a stunning birthday! Here’s a splendid birthday for a splendid person who never stops to motivate the group. Promotions and success, peace of mind and happiness. Titles and awards, achievements and records. All this is what, I hope you get a lot. Happy birthday. Thanks for being tough on me when things were easy and more importantly, going easy on me when things were tough. Happy birthday boss. U see the office with such clear and confident eyes and handle everyone with such kindness. Happy Birthday boss. U are dependable in the line of flame, however, you accept all penalties for us like a decent leader should. We value your endeavors to keep this group rolling and accomplishing. Birthday here’s to you. The most stunning boss, I salute you with birthday – a special day for you. I am extremely fortunate that I’m cooperating with U! Here’s to a tranquil day on your birthday in light of the fact that even the best bosses merit time off to notice the blooms. You guide, lead and inspire us. You are with us every step of the way. We appreciate you a lot. On your birthday, we wish you good health, success, and prosperity. Happy Birthday! It’s been a pleasure working with the inspiring and ideal boss like you. U are a wonderful leader and you deserve nothing but the best on your birthday. Best wishes on your birthday! I am proud to greet you on your birthday! I wish you have another successful year full of bright opportunities. U are the best! For a person who has taught me that the opportunity should be taken by the lapel. Thank you sincerely for all your advice, I wish you today a Happy Birthday. 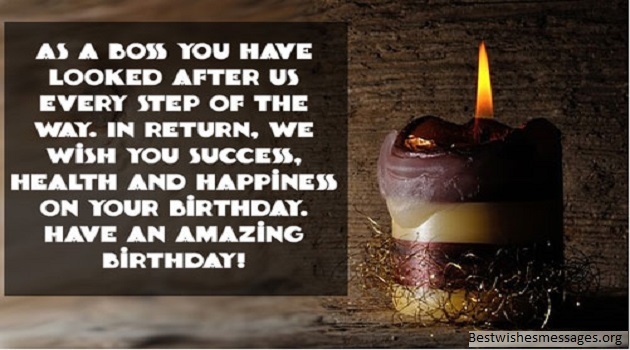 These are the best birthday quotes for boss that he/she will surely love. The professional birthday quotes for boss have been kept strictly that way. These are the office birthday quotes. 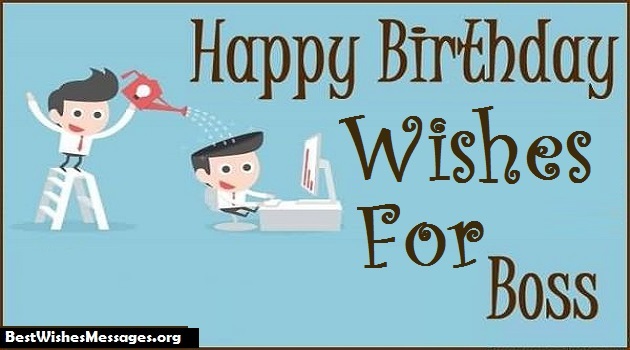 These birthday wishes quotes carry your wishes and loving message to your boss. Some of these are also funny birthday quotes that will make him laugh like crazy. You will love your crazy boss in his new avatar. We also have a set of happy birthday boss lady quotes. Your boss is your mentor, and he deserves nothing less than these pure heartfelt messages.